It is time for the sixth article in our weekly Code film series, 52 Code Films. I have committed to watching at least one new Code film each week this year. That means that every week I must watch at least one American film made during the Breen Era of Hollywood, which lasted from July of 1934 to October of 1954. However, not every film from this period qualifies for this series. These movies have to be ones which I have never seen before. Thus, they are new movies to me, even though they were made eighty-five to sixty-five years ago! This series has given me a great opportunity to discover many wonderful classic films which I had not previously enjoyed. There are so many fantastic old pictures which we classic film fans have not watched yet. Although I am sure that most of us are eager to discover new movies, I find that I have a tendency to gravitate to my old favorites. This series has made me commit to watching many new films, and I have really enjoyed it! 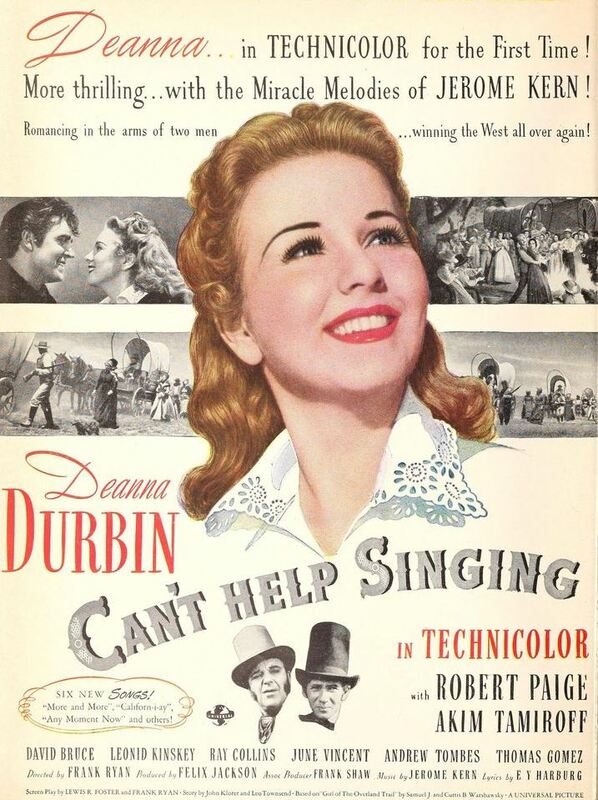 This week’s selection is a Deanna Durbin film, Can’t Help Singing from 1944. It is the only color film she ever made. This Universal musical features Robert Paige as her leading man. We watched this movie on Monday, which was the first day on which I could watch this week’s film choice. This movie was in the Deanna Durbin collection which we have. It is the fifth film we have seen with this youthful singing star. There is now only one remaining film in the collection. In the early 1850s, a senator prevents his romantic daughter from being present at the Washington celebration of California’s newfound gold, since he knows that she is infatuated with a roguish lieutenant who will be present. However, his daughter unexpectedly arrives and begins spooning with her beloved soldier. Convinced that his daughter’s sweetheart is insincere, the senator arranges to have his regiment sent out west that evening. When the daughter learns of this, she secretly packs her clothes to go west in pursuit of her lieutenant, whom she intends to marry! She goes by train and boat to the town where his regiment was sent, only to find that the soldiers have already left. Neither train nor stagecoach makes the long journey to his new location. Thus, the indefatigable girl looks into joining the wagon train which is passing her sweetheart’s location on its way to California. Upon her arrival in town, the solo girl received assistance with her trunk from two Russians, not knowing that they were conmen. The two crooks keep trying to steal and open the trunk, thinking that it contains a fortune, but they always are present when the girl looks for them, so she is unaware of their dishonest intentions. The unsuspecting young lady pays a man $500 for a covered wagon, only to later learn from the real owner that she paid a shyster who had no possession of the wagon. Back in town, she sees the crook giving her $500 to a handsome young man after a card game in the saloon. She tries to claim the money as her own, but the winner is reluctant to give up the money. Then, the saloon owner warns that the sheriff is coming to look for all those on his wanted list. He describes a long list of suspects, including a runaway senator’s daughter and a card shark, and every suspect in the room flees, leaving the saloon completely empty! The senator’s daughter and the card shark meet up by the wagon train and acknowledge each other’s wanted conditions. Since the girl needs the $500 to buy the wagon from the real owner, she lies that she is going to meet her affianced, who is the owner of the gold mines. With the hope that he will be vastly repaid by the millionaire, the winner at cards buys the wagon for her, and the two head west. The next day, they discover that the two Russian crooks stowed away in the wagon but claim they were just guarding her trunk. When the wagon train leader tells them that women must have chaperones, the card shark lies that the lead Russian conman is the senator’s daughter’s husband. As they travel across the plains, the young man keeps the girl’s real identity from being detected. As their journey progresses, they find themselves growing fonder of each other. The young lady begins to doubt the purpose of her journey as she forgets her soldier in favor of the romantic gambler. The senator’s daughter is Caroline Frost, played by Deanna Durbin. The card shark is Johnny Lawlor, played by Robert Paige. Caroline’s father is Senator Martin Frost, played by Ray Collins. The Russian conman who masquerades as Caroline’s husband is Prince Gregory Stroganovsky, played by Akim Tamiroff. His assistant is Koppa, played by Leonid Kinsky. Caroline’s soldier fiancé is Lieutenant Robert Latham, played by David Bruce. This film was directed by Frank Ryan. It was produced by Felix Jackson, with associate producer Frank Shaw. The production company was Universal Pictures. The screenplay was written by Lewis R. Foster and Frank Ryan. It comes from a story by John Klorer and Leo Townsend, which came from a novel by Samuel J. and Curtis B. Warshawsky. It features an original score of six songs written by Jerome Kern with lyrics by E. Y. Harburg. This film was nominated for two Academy Awards, Best Original Song for “More and More” and Best Scoring of a Musical Picture. This is a good Code film. It is decent, wholesome, and clean. The story features deception, especially regarding Caroline’s relationships with various men, but the situations are always decent. When Caroline tells Robert that she is going to meet the owner of the gold mines, there is no risqué implication. I thought one particularly well-handled scene was in a public bathhouse. Actually, it is an outdoor area with prop-up walls and an open ceiling. Caroline needs to clean up, and there is no hotel with baths, so she goes to the outpost’s rainwater bathhouse. We see her in a large tub full of soap suds, happily singing away. Despite her enthusiastic singing, we never see anything more than her arms and shoulders. The scene was an opportunity for her upper torso to be indecently exposed, but her person is always entirely covered by thick lather. On the other side of the wall, we see Johnny Lawlor for the first; he too is bathing. His person is also sufficiently covered by soap. I appreciate that there was nothing risqué about this potentially-troublesome situation; bathing should always be this clean in movies! This is a great example of the standard of good clean films which were still being made ten years into the PCA’s existence. Some say that the Production Code was weaker after Joseph Breen’s one-year tenure at RKO in 1941-1942, but the movies from the next ten years show us that that isn’t true. This is a good Code musical, light-hearted, cheerful, and harmlessly entertaining. This is a really good movie. It shows Deanna Durbin’s charming talent in a lovely light. By 1944, she was no longer a little girl. This was a good role for her as a mature young woman. She has a charming personality and a believable romantic development. The music in this film is excellent. I think that the Jerome Kern score is very flattering to Miss Durbin’s voice. The songs are used in tasteful places. They add to the movie without detracting from the story or slowing the pace. Robert Paige’s excellent singing voice adds a lot to the movie’s musical numbers. 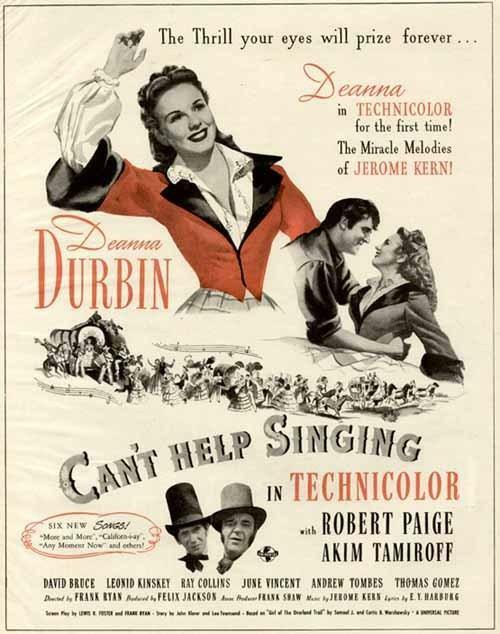 This is the first Deanna Durbin film I have seen in which her leading man can join her vocals for some romantic harmonizing. The Technicolor is beautiful; it serves as a lovely backdrop to the outdoors locations, the vital Western scenery, and the vibrant Victorian costumes. It is a shame that Deanna Durbin was not in more color films, although she also is beautiful in black and white. Some enjoyable humor is provided by the two Russian conmen. Their antics with the trunk are humorously interspersed amidst the more serious action. I highly recommend this movie to classic film lovers. It will be most appreciated by musical fans. There is a good amount of music by the revered composer Jerome Kern, and it complements the storyline; it doesn’t overwhelm it. Those who like historical pieces will enjoy the pioneer setting. The Victorian costumes are beautiful and very realistic. People who like Westerns will enjoy a brief Indian encounter near the covered wagon! This film has a good mix of various elements. It has a good script, an enjoyable premise, and a good mixture of comedy and sincerity. The acting is very good, and all the actors are believable in their parts. This is a rather unusual film which I found to have pleasant surprises. Caroline begins the film with a heart full of love for a man whom her father does not want her to marry. She embarks on a daring adventure to find this man, only to start doubting her love for him during the journey! I found this to be very realistic without mocking the romantic young woman. It had respect for her emotions, even though they led her on an impulsive and difficult journey. I think that this would be an excellent introduction to Deanna Durbin for those who haven’t seen her films. If you haven’t seen it before, watch Can’t Help Singing during a spare hour and a half. It is ninety minutes of wholesome, enjoyable entertainment which is worth your time! This week, I watched one extra new Code film, Big City from 1948, which I will review some other time.